Finally, a camera you can take everywhere you go. The COOLPIX S6100 is small enough to fit in a purse, pocket, or glove compartment—and powerful enough to capture landscapes, close ups, and portraits. This compact camera has a 16.0-megapixel CCD sensor that captures sharp, stunning images—along with a 7x wide-angle optical Zoom-NIKKOR ED glass lens that boasts a 28-196mm optical zoom to get close to the action. It’s ideal for day trips, weekend getaways, and last minute outings. On the road, on the go, in your pocket! Meet your ultimate travel companion: the ultra-slim COOLPIX S6100. It’s a mere 1.1 inches thin and weighs only 6.2 ounces. It’s so light you can slip it into your pocket and take it to the park for a family outing, an outdoor concert, or a day at the beach. Plus, it’s available in silver, black, red, and violet, so it’s as fashionable as it is portable. Touch the screen. Get the shot. Share the smiles. The COOLPIX S6100 is ready to shoot whenever you are. Just take it out of your pocket and frame your photo or movie in the three-inch high resolution 460,000-dot touch monitor. Then touch the screen to adjust, focus, and shoot. It’s that simple. The COOLPIX S6100 includes in-camera Picture Editing, so you have access to Nikon technologies like Quick Retouch, Active D-Lighting, Soft Focus, and many others. This camera even tracks moving subjects, automatically keeping them in focus and minimizing motion blur. And the screen’s brightness control and anti-glare coating make it easy to compose, view, and share your photos—you can even watch them in a slide show, complete with music. 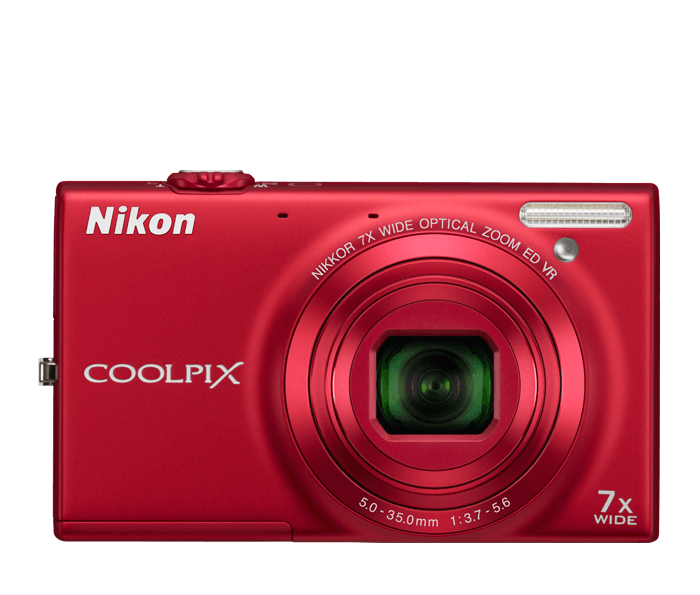 The COOLPIX S6100 is brimming with the Nikon technologies that make it a breeze to shoot high caliber photos. Its four-way Vibration Reduction (VR) Image Stabilization System automatically reduces the streaky images associated with shaky cameras. And its motion detector spots moving subjects and adjusts the camera’s settings to ward off motion blur. You’re sure to get crystal clear shots regardless of lighting conditions because the camera boasts ISO speeds up to 3200. And, with Nikon’s Best Shot Selector, you press the shutter once. The camera then takes 10 shots and selects the sharpest image. When a still picture doesn’t tell the whole story, turn your COOLPIX S6100 into a movie camera with the push of a single button. Instantly you’ll have HD 720p movies, complete with stereo sound. And you won’t miss a thing because you can zoom out to capture broad landscapes or pull in for tight shots and close ups. Better still, watching and sharing your movies couldn’t be easier, since the COOLPIX S6100 has an HDMI output for simple hookup to an HDTV or computer. Carry the COOLPIX S6100 in your pocket or purse and it will always be on hand to take great shots. Its Smart Portrait System includes Smile Timer, which releases the shutter when a subject smiles. The COOLPIX S6100 also has Blink Proof technology, allowing you to capture two shots and save the one with eyes open. The COOLPIX S6100’s, in-camera Red-Eye Fix automatically corrects most instances of red-eye as you shoot. Face-Priority focuses on up to 12 faces and Skin Softening smoothes out skin tones. Whether hiking in a park, or sitting at an outdoor café, you can easily capture crisp, detailed shots with the COOLPIX S6100. You also have your choice of 20 different Scene Modes to match your setting, or you can simply let Scene Auto Selector select one for you. Plus, it comes with a rechargeable Li-ion battery that lasts for approximately 210 pictures.